The Santa Monica Playhouse Benefit Series is an innovative program that presents extremely limited engagements of new and developing works by emerging and renowned local, national and international artists. Solo shows, concerts, spoken word and poetry nights, dance evenings, performance art and full productions, give voice to new material and artists who might otherwise not have a platform for their works. Selected artists receive a complete production package that includes marketing, technical and artistic support, rehearsal space and a fully-mounted production, with proceeds supporting the Playhouse Annual Fund, International Cultural Exchange and Diversity-in-Education programs, Artistic Mentoring, Jewish Heritage Series and Senior OutReach. Over 225 contributing artists to date include Herb Astrow, Andreas Beckett, Minda Burr, Carlie and Doni, Kelly Carlin, Irene Chapman, Melanie Chartoff, Jan Daley, Debra Ehrhardt, Christiane Engel & Jiri Tomasek, Beth Ertz, Shelley Fisher, Inara George, Richard Glaser, Barbara Haber, Scott Jones, Karen Knotts, Lester McFwap, Stogie Kenyatta, Barbara Minkus, Laraine Newman, Rochelle Newman, Luisa Omielan, Playbox Theatre, Annie Reiner, Sloan Robinson, grammy-award winner Harriet Schock, Sammy Shore, Chris Sullivan, Lily Tomlin and Jane Wagner, Mitzie and Ken Welch, Renn Woods and the late Dan Lewk, Anne Silver and Don Snell. If you are interested in presenting your work as part of the Benefit Series, please email us. We would love to hear from you. Keep checking here for upcoming shows! To make reservations, please call the Box Office at 310.394.9779 ext 1 or click on the title for more info. Written & performed by Luisa Omielan, who says, Well, if like me, you’re an Independent Woman still living at your mumma’s house, come check up on What Would Beyoncé Do? After a sell out Edinburgh and London run, Come Say Hello and let’s get this party Jumpin’ Jumpin’! ("The birth of a new star!...As funny as any comedy show needs to get!" The Telegraph) Sat, Sept 21, 8pm ($15). Rated R.
Called “breathtakingly beautiful, from the poetry on which it was based, to the heart wrenching performance of each actor on stage” (The Examiner), Theatre Roscius' HerSheMe is an amalgam of physical theatre and performance art, smashing together variations of human sound and text, with a nod to theatrical roots in Greek tragedies, all coming together to create a powerful and unique evening of new theatre. Thurs, Nov 14, 8pm ($10). Actress, singer, comedian, clown, magician, puppeteer and ventriloquist Karen Knotts, the daughter of comedic American acting genius Don Knotts shares on life, love and growing up with a famous dad (and The Andy Griffith Show). Written & performed by Karen Knotts. Directed by Anderson Gabrych. Associated director Joe Coddington. ONE BENEFIT PERFORMANCE ONLY! Friday, February 7, at 8:00 pm ($15-18). Call the Box Office at 310.394.9779 ext 1 or Purchase Online. 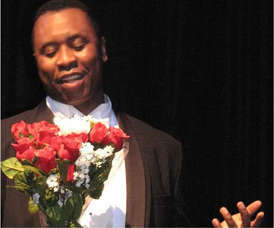 Stogie Kenyatta's acclaimed show about African-American artist-activist Paul Robeson, whose life's work celebrates our common humanity as he fought globally for social justice. Back by popular demand for two shows only: Sat, Nov 5, 8pm; Sun, Nov 6, 7pm ($20). Written and performed by Jean Franzblau, developed and directed by Karen Aschenbach. Three parts sugar and one part spice, this show follows one adventurous woman's curious exploration of her sexuality. Sat, March 2, 8pm ($20).